New York City Mayor Bill de Blasio and NYC Assembly Speaker Corey Johnson have struck a deal that will give low-income New York City transit riders a roughly 50% fare discount starting next year, under a program called “Fair Fares”. Up until the past week, Mayor de Blasio resisted the discount, saying the state should pay for all things transit. The council had already approved $212 million to cover the subsidy for all of 2019, for riders earning less than 200% of the federal poverty level (the same standard King County Metro uses). The deal will have the City covering just $106 million of subsidy next year, with the expectation that most of the estimated 800,000 New Yorkers who would be eligible would not take full advantage of the opportunity. The New York Metropolitan Transit Authority has been in the process of moving to smart card and cardless fare payment for several years. 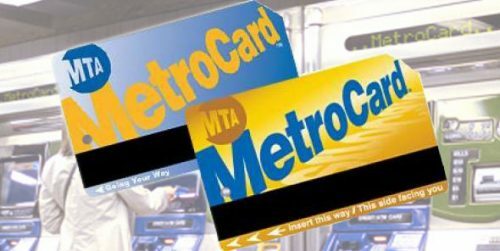 Regardless, the magnetic-strip MetroCards will be able to handle the low-income discount, just as they do for senior and disability discounts. Riders are able to reload MetroCards most of the ways we can reload ORCA cards. The main difference is you have to choose an “unlimited-ride MetroCard” (a pass) or a pay-per-ride MetroCard. Portland’s TriMet transit agency will be rolling out a low-income fare July 1. The fare will be $1.25, matching TriMet’s senior, disability, and youth fares. Regular fare is $2.50. Those using a Hop Fastpass will get to ride free after spending $2.50 in fare each day, and after the first $28 each month — a 72% discount from the regular monthly $100 cap, which is the same as the youth, senior, and disabilities discount. Riders with income 200% or less of the federal poverty level will qualify, with requalification required every two years. One additional qualification is that recipients have to be Oregon residents. However, the discount is still good on Vancouver’s C-Tran bus system. The $3 fee still applies for getting the Hop Fastpass card, or for getting a “virtual card” for smart phone use. The estimated $12 million of fare subsidy will be funded by a 0.1% payroll tax, approved by the Oregon Legislature last year. The tax will generate ca. $40 million each year. A community group called Organizing People / Activating Leaders (OPAL) has been pushing for the low-income fare for several years. This group spearheaded the creation of the membership-based Bus Riders Unite!, which focuses on representing the transit-dependent population. Kitsap Transit was the first US transit agency to have a low-income fare program, starting back in 1985, and long predating the use of “smart card” technology. King County Metro joined the program and re-branded it “ORCA LIFT” in March 2015. Sound Transit, Seattle Streetcars, and the King County Water Taxis joined in. As of July 1, Metro, light rail, ST Express buses, and Seattle Streetcars will be charging a uniform $1.50 LIFT fare. Kitsap buses, intra-county ferries, and eastbound cross-Sound passenger-only ferries will charge a $1 LIFT fare. Eastbound car-and-passenger ferries have long been free. Minneapolis/St. Paul Metro Transit recently rolled out its Transit Assistance Program, allowing low-income riders below 50% of the median area income to get a $1 fare, using the smart Go-To card. Regular fare is $2-$2.50, depending on time of day. SunTran, in Tucson, also has a low-income fare program, which is aligned with the youth/senior/disabilities 75-cent fare as the “Economy Fare”. Regular fare is $1.60 with the SunGo card, or $1.75 cash. The Lower Living Standard Income Level, set by the US Department of Labor, is used as the qualification cut-off. The Ann Arbor Transit Authority has a Fare Deal Income ID Card, enabling a 75-cent fare (same as the senior, disability, and student fare). Regular fare is $1.50. No smart card is involved. The Charleston Area Regional Transportation Authority offers a $1.25 low-income fare using a CARTA ID card, which is not a smart card. Regular fare is $2 local and $3.50 express. The senior fare is $1, and only available off-peak. The disability fare is 75 cents. Denver‘s Regional Transportation District had a Pass Program Working Group look at its fare system in 2017. The group recommended creation of a low-income fare, for riders earning below 185% of the federal poverty level, with a 40% discount from the regular fare. Board action is months away, and will likely look different than the group’s recommendation. Early indications are that the subsidy would be funded by an increase on regular fares, and a premium fare for the train to the airport. Four San Francisco Bay Area transit agencies, including Muni, BART, Caltrain, and Golden Gate Transit, are considering a program to give a 20% discount to riders below 200% of the federal poverty level, using the Clipper Card. The lost fare revenue would be partially funded by the state. How much beurocracy does one have to jump through to actually claim the fare discount? Does it require taking time off work in the middle of a weekday and making a long bus trek to an office? Or can the whole thing be done online? I checked the website, and it appears that they have a few locations, but you are limited to having to get to one of them Monday through Friday, 8 am to 5 pm. If you are a secretary or food service worker or clerm who works banking hours, you are completely out of luck. Neither agency has posted details of where to go. I assume TriMet will put the details up on the web on July 1. Every low-income discount program so far has required an office visit as the primary method. That said, King County Metro regularly has some of its partner agencies give out low-income cards at its travelling table, to those who bring the qualification paperwork to the table. You have to recertify monthly to get the sticker for the next month. The savings doesn’t cover taking a day off from work to go get it. I’m not sure why the Clipper-based low-income fare is only being offered at a 20% discount other than budgetary reasons. There are other oddities listed on that page, like sneaking through a turnstile that opens automatically and boarding the back of the bus. Bizarre. Free daily tickets distributed through human service agencies are still the industry standard, with a vary high ratio of administrative cost to benefit received. There are a handful of smaller agencies that give out free monthly passes instead. At any rate, I expect the 20% discount for the Clipper-based discount to expand over time, eventually making this monthly-requalification program moot. I am a big fan of your blog, and also an employee at TriMet in Portland. Firstly, keep up the great work! I just have one (very small) clarification to make: the fare card we use is correctly written as “Hop Fastpass” not “HopFastPass”. Where are you getting the “200% of the federal poverty level” qualification for the discounted MTA fares? The AMNY link and every other source I’ve seen says that only people below 100% of the poverty line would qualify. I made a bad assumption from looking at the ORCA LIFT qualification chart and multiplying by 12. The unstated math in the articles seem to assume there are 4.0 people in a typical below-the-poverty-level household. At any rate, thanks for the correction. In a country this rich, why not save ourselves the math and put everybody’s income above the poverty line?And today’s visit to Seattle, and the one before gave me an idea how. For some reason the most money Seattle has ever had left on the tile walls at IDS the worst graffiti I’ve ever seen in the 30+ years since DSTT opening. Tempted to not even ask anybody about volunteering to clean it up and just get the chemicals and brushes and just do it. What in the procedure that produces mammalian life is going on here? It seems to me I saw people living under tarps on a street corner not far away, landmarked by Central/Atlantic Base. So let’s take advantage and see how many reduced fares we can bring up to working-wage level. And incidentally, got replacement for the “Head Tax” that might fly, because it targets the exact people who are benefiting the most from the exploding housing market and contributing the least to remedy its worst effects: A tax on evictions. Considering the number of consequences these procedures cost Seattle and the Region, shouldn’t even call it a tax, but a bill.